The directions are to be effected from the academic year 2018-19 onwards. Any attempt to violate the order of this Court would be viewed very seriously as it affects the young children and our nation, states the Order. Madras High Court on Tuesday directed the Centre and States to prohibit homework for Class 1 and Class II students in all schools (including CBSE) in the Country. The Court also directed the Government to direct the State Governments forthwith, not to prescribe any other subjects except language and Mathematics for Class I & II students and language, EVS and mathematics for Class III to V students as prescribed by NCERT. Justice N Kirubaran was hearing a petition filed by M. Purushothaman, a practicing advocate challenging the circular issued by the CBSE, dated 29.07.2017 and further direct the respondents viz., Department of School Education and Literacy Human Resource Development Ministry, Government of India; National Council for Educational Research and Training (NCERT) to require the CBSE schools to buy books published by NCERT alone and not the books published by private publishers. “…..many experts find that homework is beneficial only to older kids whereas young children are notably lacking in “executive control”, the ability to concentrate, to follow directions, to control impulses and keep the details in mind. Therefore, it is unrealistic to expect the KG students, first and second class students to do homework, assignment on their own and homework to class I and II children have to be prohibited”. (a) Direction to the respondents, especially the respondents 3, 4 and 5 to prohibit CBSE schools from prescribing any homework to Class I and II students. (b) Direction to the respondents 3 and 4 to constitute flying squads to randomly verify that Class I and II children are not given homework. (c) Direction to the first respondent/Union Government to direct all the State Governments and union territories forthwith, not to prescribe any homework for Class I & II students in the State Board/Matriculation/Anglo Indian schools. (d) Direction to the first respondent/Union Government to direct the State Governments forthwith, not to prescribe any other subjects except language and Mathematics for Class I & II students and language, EVS and mathematics for Class III to V students as prescribed by NCERT. (e) Direction to the respondents to disaffiliate schools prescribing homework and non-prescribed subjects for Class I and II students and class III to V students. (f) Directions to the respondents especially, respondents 3 to 5 to prescribe and use NCERT books alone as per CBSE circular dated 09.08.2017 and other circulars. 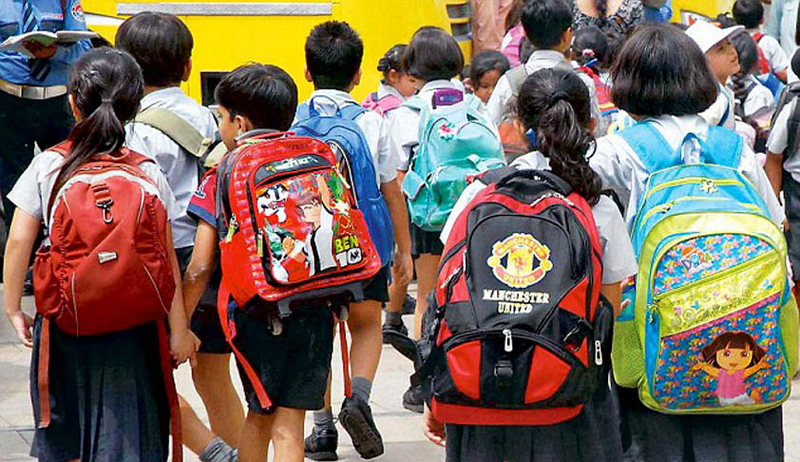 (g) Direction to the Union Government to formulate a policy forthwith in the lines of “The Children School Bags (Limitation on Weight) Bill, 2006". (h) Direction to the Union Government, the first respondent herein to direct the State Governments and Governments of Union Territories forthwith to formulate "Children School Bag Policy" reducing the weight of the School bags in the line of guidelines issued by either State of Telangana or State of Maharashtra. (i) Direction to the Union Government, the first respondent herein to direct the State Governments and Governments of Union Territories forthwith to form special squads to inspect the schools and prevent the use of non-prescribed books. (j) The respondents are directed to issue circulars to the schools incorporating the orders of this Court forthwith and file a report within four weeks. The Court also observed that children are the assets of our nation. “They have to be nurtured properly and taught age-appropriate education which would foster creativity in the minds of younger children. The level of education has to be balanced as per the age and ability of the child giving enough scope for holistic overall development of the child which includes play and social skills. Any attempt to thrust unnecessary subjects over and above the subjects prescribed by NCERT would definitely affect the mind and health of the children causing fear, anxiety, stress in their minds and in the minds of parents. Therefore, this Court has to issue directions safeguarding our children. The directions are to be effected from the academic year 2018-19 onwards. Any attempt to violate the order of this Court would be viewed very seriously as it affects the young children and our nation”. The Court observed that the school bags are made very heavy causing health hazards to the Children. Children are made to carry books and notebooks unnecessarily. No stakeholder is interested to look into the issue. Only States of Telangana and Maharashtra took serious note of this pressing issue and issued appropriate guidelines restricting the weight of school bags. “Therefore, there shall be a direction to the first respondent/Central Government which shall direct the State and Union Territories to take a policy on "School bags" and issue guidelines in the lines of “The Children School Bags (Limitation on Weight) Bill, 2006" reducing the weight of the school bags, according to the class”. (viii) Homeworks given to Classes I and II students would put pressure on them and affect sleeping time of the children. (ix) Compulsion to read non-prescribed books which are not age appropriate would have adverse effects on younger minds. (x) Children should not be made to carry heavy school bags at the risk of their health and carry light school bags.